The wife of the Caern Warder and legal owner of the land the caern currently sits in. Lamentation is the sole Survivor of the Silverwood Manor Caern Massacre She was renamed Lamentation for the tragedy she survived. Lamentation was a Silver Fang kinfolk from House Wyrmfoe, she was raised on in the Silver Fang Caern there was really nothing odd about her compared to any other kinfolk in the caern, though she did like to play in the wood a little deeper then most kin go and enjoyed learning about the local history. When the Caern was attacked Lamentation used a hiding spot she had found and use to hide her toys in as a little girl waiting for the danger to pass or for her to be found. In the end she was found but by reinforcements who came too late to turn the tide of the battle. She was renamed Lamentation despite the Silver Fangs knowing her name because they keep very close track of their kinfolk, her renaming was purely in honour of the caern that fell, as the last remaining member of her family the land and all the property now belonged to her. Lamentation decided she wanted to become a teacher in History. She lived in the Cottage on the grounds which was formerly Silverwood Manor's guest house. When the Caern was officially abandoned Lamentation hosted the visiting pack best she could. 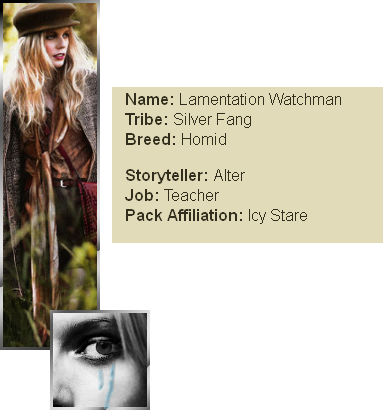 After the re-opening of the Caern Lamentation was married to Alpha of the Icy Stare, Edelmar Watchman. Lamentation is a substitute teacher specializing in History and English she lives on the Bawn in Silverwood Cottage with her husband Edelmar and her son who isn't quite two yet. She changed her last name to Watchman for her husband's deed name after the wedding. Some people call her Lament for short.